Hannah died before September 9, 1758. "Massachusetts, Births, 1841-1915," index and images, FamilySearch (https://familysearch.org/pal:/MM9.1.1/FXC7-D7S : accessed 13 Dec 2012), Henrietta S. Hart, 1852. "Massachusetts, Births, 1841-1915," index and images, FamilySearch (https://familysearch.org/pal:/MM9.1.1/FXC4-5NJ : accessed 13 Dec 2012), Hart, 1852. "Massachusetts, Births, 1841-1915," index and images, FamilySearch (https://familysearch.org/pal:/MM9.1.1/FXZM-DPP : accessed 13 Dec 2012), Hannah M. Carey Hart in entry for Martha Maria Carrie Hart, 1862. "Massachusetts, Births, 1841-1915," index and images, FamilySearch (https://familysearch.org/pal:/MM9.1.1/FXZH-GMT : accessed 13 Dec 2012), Maria Hart, 1865. 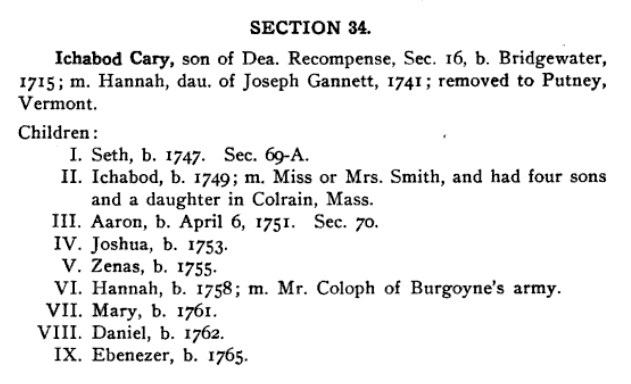 "Massachusetts, Births, 1841-1915," index and images, FamilySearch (https://familysearch.org/pal:/MM9.1.1/FXZD-GZJ : accessed 13 Dec 2012), Hannah M Carey in entry for William Wiltshire Hart, 1867. "Massachusetts, Births, 1841-1915," index and images, FamilySearch (https://familysearch.org/pal:/MM9.1.1/FXZL-QT2 : accessed 13 Dec 2012), Lizzie Bell Hart, 1869. "Massachusetts, Deaths, 1841-1915," index and images, FamilySearch (https://familysearch.org/pal:/MM9.1.1/N7VZ-8LS : accessed 13 Dec 2012), Hannah M. Carey in entry for Lizzie B. Hart, 1870. "Massachusetts, Marriages, 1841-1915," index and images, FamilySearch (https://familysearch.org/pal:/MM9.1.1/N4QT-3JN : accessed 13 Dec 2012), Hannah H. Carey in entry for Fred W. Judkins and Susan H. Hart, 1877. "Massachusetts, Deaths, 1841-1915," index and images, FamilySearch (https://familysearch.org/pal:/MM9.1.1/NWGQ-X4W : accessed 14 Dec 2012), Susie H. Judkins, 1878. 1880 United States. Census Office. 10th census, 1880 federal population census, Washington, District of Columbia: National Archives and Records Service, ([19--]) , Census Place: Wakefield, Middlesex, Massachusetts; Roll: 542; Family History Film: 1254542; Page: 409A; Enumeration District: 415; Image: 0173. "United States Census, 1850," database with images, FamilySearch (https://familysearch.org/ark:/61903/1:1:MC2F-Y36 : 9 November 2014), Harry Carey, Townsend, Windham, Vermont, United States; citing family 50, NARA microfilm publication M432 (Washington, D.C.: National Archives and Records Administration, n.d.). He was the son of Col. Simeon Cary and Mary Howard. Bradford Kingman, History of North Bridgewater, Plymouth County, Massachusetts, from its first settlement to the present time, , at https://books.google.com/books?id=B-tHAQAAMAAJ . Boston: Published by the author, (1866) , p. 464 lists birth as 31 Aug 1760. Seth C. Cary, John Cary, the Plymouth pilgrim, , at https://books.google.com/books?id=oDgcAAAAYAAJ . Boston, Massachusetts: (1911) , pp. 123-4. Vital records of Bridgewater, Massachusetts, to the year 1850, Boston, Massachusetts: New England Historic Genealogical Society, (1916) , Vol. 1, p. 68. Book of the First church of Christ, in Middleborough, Plymouth county, Mass, , at https://books.google.com/books?id=2TYWAAAAYAAJ . Boston: C. C. P. Moody, printer, (1852) , p. 97. Nahum Mitchel, History of the Early Settlement of Bridgewater in Plymouth County, Massachusetts, , at https://books.google.com/books?id=KIc-AAAAYAAJ . Bridgewater, Massachusetts: Henry T. Pratt, (1897) , p. 134. Seth C. Cary, John Cary, the Plymouth pilgrim, Boston, Massachusetts: (1911) , p. 91. Record added: Aug 08, 2006. He was the son of Dea. Jonathan Cary and Mary Curtis. "Massachusetts Deaths, 1841-1915," database with images, FamilySearch (https://familysearch.org/ark:/61903/1:1:N72Y-C96 : 10 December 2014), James Cary, 10 Aug 1850; citing N. Bridgewater, Massachusetts, v 49 p 161, State Archives, Boston; FHL microfilm 959,813. Seth C. Cary, John Cary, the Plymouth pilgrim, Boston, Massachusetts: (1911) , p. 65, section 4. Jane Cary was born perhaps about 1829.